Published on April 3, 2011 in Leadership and Time Management. 0 Comments Tags: Highway Repair, Japan Earthquake, Japanese Highway Engineering. As you know, as a regular reader of this blog, it is focused on concepts and ideas related to one central theme- Exponential Mindset Thinking™. Today’s post is timely because of the tragic circumstances of the Japanese earthquake and tsunami. 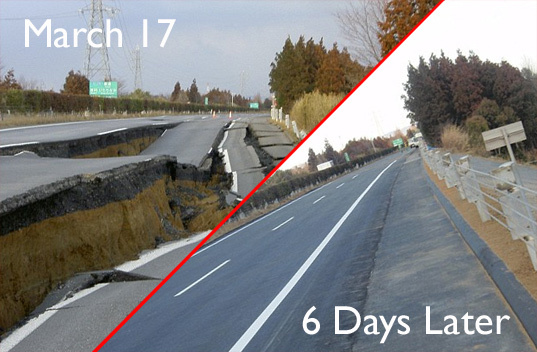 This BEFORE and AFTER photo says it all..
That being said, this is a testament to the Japanese people’s resilience and their engineering and construction expertise deployed with flawless execution. I know several local Sydney Engineers who discussed this with me just last week – also impressed by the lighting-quick speed of construction. This is proof positive of the power of the human spirit to overcome all obstacles and the brilliance of professional engineers to provide solutions that affect us all.